Original Australian Nappa Mini ugg boots made in Australia from genuine Australian double faced sheepskin. Buy online here, select required options, add to cart, proceed to our secure checkout and pay with PayPal, credit card, debit card OR buy at our SYDNEY FACTORY OUTLET where you can get FREE pair with BUY 3 GET 1 FREE special offer and save up to $200 or get $10 cash discount for each pair paid by cash. I ordered two pairs from them, both items arrived in good condition and I was extremely impressed by the quality and appearance of my new boots, unfortunately one pair was a bit small ... I returned the item for exchange and had my boots in 2 days. Ordered a pair of boots online. They were sent from Sydney on Monday and arrived at my door on Friday in London, 5 days before the estimated delivery date. Very nice. Very comfortable, well made, this is my 3d pair!! fantastic product! Must have! incredibly comfortable. definitely a must buy! it is exactly as expected!amazing, so comfortable!these are definitely worth the price! absolutely happy with my new ugg! fantastic quality! absolutely amazing shopping experience! so convenient, easy! I will absolutely be back! I recently bought 2 pairs of nappa boots, these are of excellent quality and value and I will purchase again from this company without hesitation. THANK YOU AUSTRALIAN UGG ORIGINAL!!! product purchasing uncomplicated and delivery was fast and prompt, my two pairs ordered are perfect , lovely quality, good fit! will recommend the site! quality isn amazing! delivery is fast! will recommend! Love this leather version of my favorite winter boot! Once you get them on they’re super cute, comfy, and cozy! Thank you Australian UGG Original, love my uggs! Fantastic uggs. Prompt service. Really pleased ad thank you. Considering there are so many websites out there selling shoes I feel lucky to have found this one! Simple to place order, cheaper than competitors and very swift delivery. I usually take size 11 but ordered size 10 and they fitted perfectly. Now I wear them everyday and they look and feel great. I had purchased 3 pairs in Bomber and first of all, shipping was very quick! The quality is fantastic! Price is really good! I was very happy!! Perfect for Fall and Winter!! I am a really big uggs fan and was looking for something a little different. I purchased the Bomber Mini. Love this color! The first day I wore them, I had a dozen compliments on these cute boots! Totally reliable and the best quality I could find online. I am a person who cannot be without my slippers for even one day so I found them on this site for a good price. I was delighted with the quality. good company. BOUGHT NAPPA MINI IN CHESTNUT - REALLY PREMIUM QUALITY!! THANK YOU! WILL RECOMMEND! I was after a REAL ORIGINAL Australian sheepskin boots. I need Australian made product, not cheap fake. And I found!!! The order process was easy, and the items arrived exactly when expected. Great quality, the best quality I have ever seen. Absolutely happy and will recommend! I ordered Nappa Mini in BLACK AND RED. I had checked various websites for my uggs and none of them came close to the quality I got on your website! Very impressed and will come back again. and - a b s o l u t e l y Australian and g e n u i n e A grade sheepskin, now I can see! recommended to everyone! Brilliant quality! I am very impressed! This purchase was absolutely great and boots arrived without delay. I love my 5 star uggs so much, Australian authentic uggs, Australian made and VERY WELL made. Will recommend this store! Very impressed with quality of a boot. Excellent quality. I bought NAPPA MINI in CHESTNUT and absolutely happy. Overall this experience was truly smooth , seamless and simple. I was able to find what I was looking for easily and the purchase was better than I expected. The quality of my Chestnut Nappa Mini was excellent. Antique and stylish, fashionable and modern! In my case the delivery was much quicker than stated and I received my boots in time. Excellent all round. Great service,quick delivery and high quality. this boot is most comfortable thing I have ever worn on my foot! I bought a black pair and now i am back for chestnut!!! 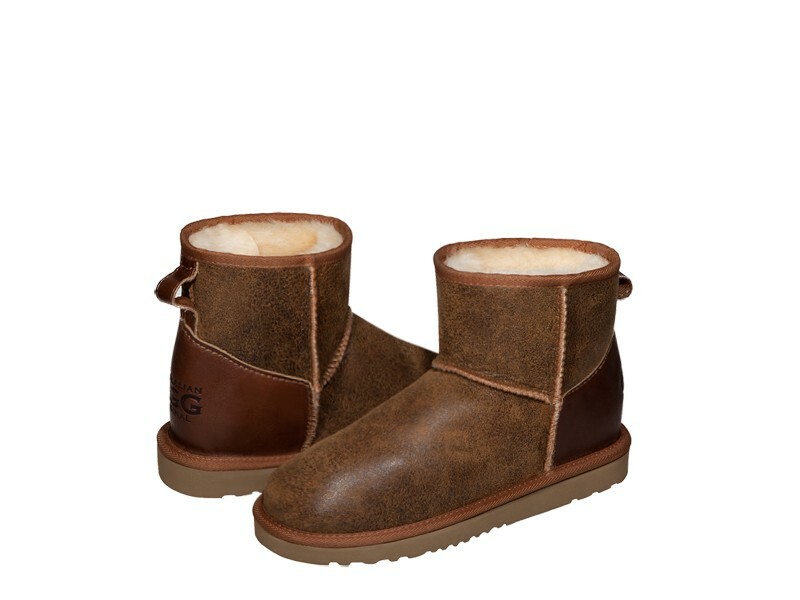 I have been looking for a pair of good nappa ugg for a while. Finally I found AUSTRALIAN UGG selling them. So...I really enjoyed the quality of product and excellent service there. 5 stars! Received the item as described within 2 days. Such a surprise to have something on the net come so quickly and as promised. My son was thrilled to have his NAPPA uggs, he fell in love with them. Thanks for the outstanding quality which made your product the best! We will certainly use your site again and would recommend you! Ideal for the man who knows what he wants. )) Boots arrived the next day and were hi-quality items at a very fair price. Friendly staff, great service and excellent quality! Very efficient service even when returning for an exchange. Recommended! Thank you very much for the first-grade product and prompt customer service. I appreciated your support from order to delivery. I will definitely visit your website again and will recommend to all my friends! I hesitated to buy these boots since I live in Florida. I was afraid that I wouldn't get to wear them often enough. Surprise, not only are they warm and cozy on our cool days, they are not too hot on our warmer days. They are just right! I ordered a NAPPA MINI. The item arrived in time! Great quality great service and great price! I will definitely be a returning customer. The boot is a high quality leather on the outside and soft, warm and comfortable on the inside. I ordered a size than I usually take for the perfect fit. Wonderful, except... I bought these in black. They are great, except the black dye rubs off on my skin, leaving marks when I take them off. I've had to resort to wearing socks if I'm going to wear different shoes later, but love them anyway. I recieved the nappa minis in chestnut. I have worn them almost every day in the winter, and I love them! They are a little pricey, but they are definitely worth it! And I am starting to save up to buy myself a new pair in classic "black and red" because I love them so much! These boots are so incredible. I got a Nappa Mini in Bomber style and I've been in love with them ever since! My friends have them and they agree that they are the best shoes to have. These boots are the best footwear i have bought in a long time so comfy and stylish i have just purchased my 3rd pair and i still intend to buy more love them. Great boots!!!! Love them! Many thanks to a great company for it's wonderful service! Gift to my daughter! She loves the comfort and casual look of the original Australian made uggs! Bought this pair as grandma requested for Christmas. So what can I tell - thats the best Christmas present! Great quality, gorgeous and beautiful! I bought the chestnut nappa colour which is a little more light than I expected. Other than that they are just perfect. So comfortable and warm I might have to buy a second pair. absolutely love this boot. It fits perfectly. the one thing causing me to buy a new pair are the snow stains. after wearing it in the snow for a while, the salt from the road made white stains. anyway, they are very warm and comfy, I would recommend it to everyone. They are warm and comfy. They are so cute. I totally would recommend them to my friends and everyone who love stylish uggs.They perfect for any season. These shoes are worth buying. I bought these in size 7 which is what I have already ordered in button style. Bought these for my husband who is quite "selective" and he really liked them. They are very versatile, can be worn inside and outside and of course comfortable! Definitely a great purchase! Of course, ugg boots are ugg boots. This was the only online source I found Nappa chestnut bomber. They look and feel great! These are warm, nice, and comfortable. I didn't want to take them off. recommended! Uggs are definitely worth the money. I got my first pair last year - nappa short - and they still look brand new. I bought these 2 years ago they still look new. I’ve bought other pair and I will keep buying them. Worth the price! Awesome winter shoe! Perfect gift for my family in China! Great product, excellent service, the best price for AUSTRALIAN made product! Prompt shipment. Nicely packaged. Warm boot just as I expected. Love it! I bought these boots for my wife for last Christmas and she loves them. She wears them at every opportunity. I am not a frequent on-line shopper, but when I couldn't find the right uggs, someone told me about you. and it has been a wonderful experience! thank you! I always rely on customer reviews before making a final decision. So I thought this may help out someone too. My recent purchase was received on time and boots are perfect! I love my boots and shipping was very fast as usual! I own a few pairs and I think these ones are my favorite. I got my black Nappa Minis today! It took me a long time to decide between the classic minis, which I have in gray, and the Nappa, but the moment I put them on I knew I had made the right decision! Heavenly softness for your cold feet when you are in a hurry! These are so fabulous! And great for the indoors and outdoors as well. AND AGAIN - INCREDIBLE QUALITY! We are happy that we have found this stylish boutique australian ugg store. We have felt in love with your original australian ugg boots and now we are fully equipped and ready to visit cold countries. We love your uggs!!! I am delighted with a combination of quality of these original Australian made ugg boots and their factory direct price. I will recommend this online store to my friends.